Apple Gin is not a new creation. Once a more common cocktail ingredient, it has since been exiled to the furthest corners of the bar and liquor shelf. 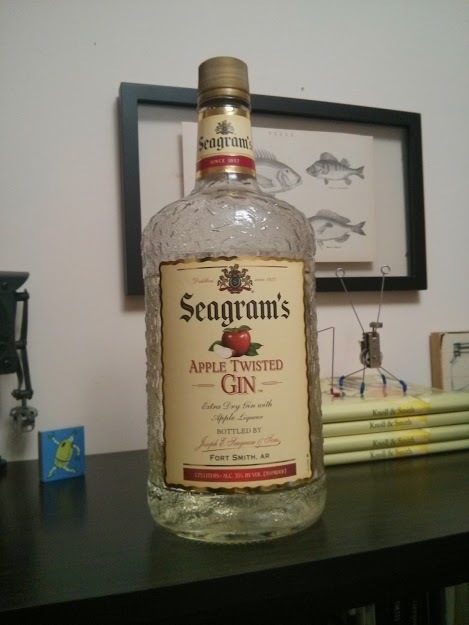 Seagram’s Apple Twisted Gin brings it back. Faint apple juice and faux jolly rancher green apple on the nose. That’s about all. Not a lot of depth, you might confuse it for apple liqueur, of [my first guess], green bottles of apple flavored martini mix. The taste of Apple Twisted Gin is a bit more of the same, with some juniper tinge on the finish. Sweet apple dominates, hints of citrus and spice on the edges. Doesn’t really push the envelope on the subject. It’s more apple liqueur. Reads as “fake,” which I think hurts it a bit in terms of what you can do with it. With tonic its palatable, but Apple Twisted Gin is stuck in artificial flavor rut. The bitterness helps quell the fake apple taste a tad, but not enough to make folks who turned their up at the nose to come back around again. I’ve often seen the suggestion of using it as a mixer with ginger ale. It’s certainly very drinkable, but I don’t think it really goes far enough to balance the apple flavor. For that, we need some drinks. I mixed with with some St. Germain Elderflower Liqueur, about 2 parts gin to 1 part St. Germain. Not too bad, the Elderflower does take over the taste, but you get these nice apple notes in the background, and oddly, it emphasizes the iota of a juniper in here. I tried a martini as well, but came away unimpressed. The martini, I actually think the herbs of the Vermouth play nicely with a note like the apple, but it still just kind of feels like cough drops and jolly ranchers. I will give passing marks to the Apple Negroni as well. Interesting, with Campari and Vermouth dominating most of the palate, but the apple creeps on the edges of the finish, surprisingly subtle. Notes of almost baked apple-raspberry pie here. Nice. Cloying fake apple, but really the only apple flavored gin out there. I wish Apple Twisted Gin was more authentic [to the taste of apples] or had a tad more juniper in it. Likely more appealing to the pour with a mixer crowd than the cocktail crowd. Try Half-Moon Gin–our understanding is it is an apple? based gin–awesome Negronis–we can’t get it in NOLA but had it at 51/2 bar in Pensacola, Fl. Apple based, but not apple flavored. Seagram’s adds apple liqueur to gin after distillation. Half Moon actually distills apples to create the neutral base spirit. Believe Chase in the UK also does this. I’ve had Half Moon gin, and it’s vaguely more floral- kind of a pear/apple sweetness, but not too literal. I’d contrast both of these “apple flavored,” and “apple base” gins with a gin like Dry Fly which uses apple as a botanical in their gin. You definitely get some of the apple notes coming through, a bit more clearly than in the Half Moon, but I think the differences between bases are much more subtle than are the differences between botanicals. Apple Gin = apple flavoured gin – often through simple infusion and it was not uncommon to sweeten it – popular in the UK. Apple-base gin – Chase. Half-moon, CapRock all make their gins from what is essentially distilled cider. Gin with apple botanicals – Dry fly, Caoruun, Elephant and others.